In this class we move with the breath with fluidity and focus in a dynamic fun and continuous practice. In these classes poses are adapted where necessary to suit your body, working poses in stages from basic to more advanced, caring for your body rather than forcing your body into poses. Sarah also emphasises the psychological and spiritual benefits of Yoga and meditation weaving in philosophical themes, ancient Yogic teachings as well as modern-day poetry to help you live a more fulfilled and calmer life. 4:30 pm-5:30 pm Hatha. Canadian International School staff and teachers only. All levels. 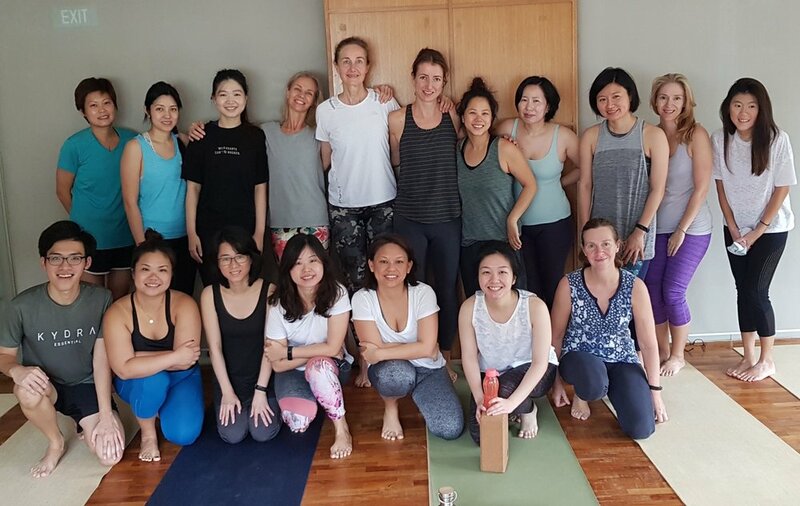 This is a fabulous 90 minute Yin/ Yang weekend set up class! Roughly half of this class is a combination of alignment based Hatha and strong slow flow. Both build up heat and strength in the body (Yang). We then change to the more meditative practice of Yin Yoga. Here you will hold passive floor poses for up to 5 minutes opening the deeper tougher connective tissues of your body. This method of Yoga brings more flexibility as we open these deep tissues. It also opens up the nadis (energy channels) and so enables a much smoother flow of prana around the entire body. Sarah has such wonderful energy and always explains poses and transitions well. I like how she has a specific focus for each class, and guides us in a sequence of poses to lead us to a difficult pose. Please pay Sarah either In person at class by cash or cheque. Transfers with PayLah or PayNow are also an option. Perhaps you're a complete beginner and would like to thoroughly learn the basics before joining a class? Or do you want to really build up your intermediate practice and learn some of those tougher poses? Or maybe studio classes times don't fit into your busy schedule? Or perhaps you'd just like a one off or a group of three classes to address a particular issue you're working on. Private Yoga lessons are tailor made to fit your needs. Prices may increase depending on traveling time and distance. Please contact me at info@sarahbyoga.net for a chat and to book your class.